1. The bowhead whale can live to be 200 years old. Other species of whales only live to be in their 20s. 2. Whales are the largest animals on earth. 3. The blue whale is the largest species of the whale. Blue whales have been known to grow as long as 115 feet and weigh more than 150 tons. However, most blue whales measure between 70 and 90 feet long. 4. Groups of whales that travel together are typically referred to as “pods.” Pods can have more than 100 whales, but they are generally between 2 and 30 whales. 5. Whales have a very keen sense of hearing. In fact, it is likely their strongest sense. In the water, toothed whales use a tactic called echolocation, which means they emit sounds which then bounce of things that are in front of them. They can then use that sound to determine what is around them. 6. Whales are found in every ocean in the world. Beluga whales are found in the areas of Alaska, Greenland, Canada and Russia. 7. There are two main types of whales recognized by scientists. They are the toothed whale and the baleen whale. Within these two main categories, there are several subspecies. 8. Baleen whales have two blowholes while toothed whales have one blowhole. 9. Some of the different subspecies of whales include the blue whale, gray whale, minke whale, beluga whale and the pilot whale, just to name a few. 10. Pilot whales are typically black or dark gray in color. Male pilot whales can measure up to 25 feet long and weigh as much as 6000 pounds. Female pilot whales measure about 16 feet and weigh about half of what the male weighs. 11. Beluga whales communicate and socialize with each other with high-pitched sounds. This species is believed to be the most social of all species of whales. 12. The Narwhale species of whale can dive nearly 5000 feet. They also have a very specific diet that includes halibut, shrimp, squid and cod. This is one of the main reasons why the Narwhale whales do not migrate. 13. Humpback whales are very acrobatic and they are often trained in captivity to do stunts for aquatic shows. 14. Gray whales will consume water, food, sediment and debris as they swim through the water. They do, however, have a filtering system that removes anything that is not food from their system. 15. There are an estimated 80 different species of whale living in the world today. Of those 80 species, there are about one million whales in all. Several of the species are endangered, too. 16. There are two main seasons for whales – mating season and feeding season. During the feeding season, the whale swims to a tropical climate to gather food and build up their blubber to last until the next mating season. 17. Depending on the species of whale, the gestation period can range anywhere from 10 to 17 months. A female whale will give birth to an offspring every 2 to 6 years during its fertile years. 18. 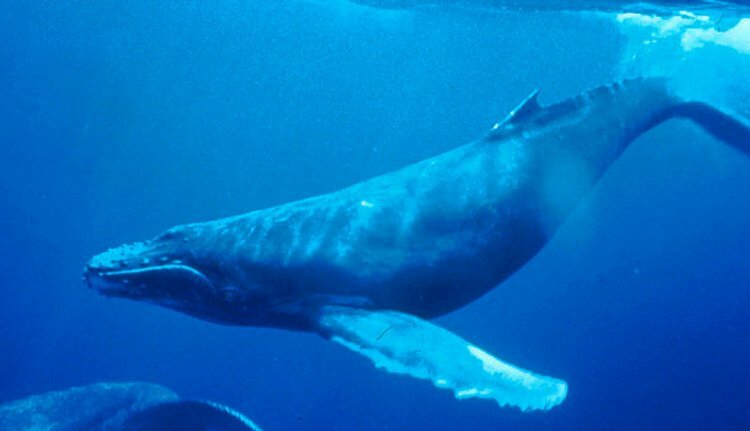 Most species of whales do not have a throat that is big enough to swallow a person. 19. Whale feces is used to feed phytoplankton, which helps remove harmful carbons from the environment. 20. Whales are actually mammals. They breathe air, produce milk, they are warm blooded and they bear offspring. 21. Some whales spend up to 90 percent of their time underwater. They will come to the surface only to socialize with other whales and to restore their oxygen. 22. Whales must make a conscious decision to breathe. That means that if their entire body falls asleep, they could actually suffocate. As a result, part of their brain remains awake to ensure that the whale does not stop breathing as they sleep. 23. To communicate with others, whales will slap their tails on the water, charge toward other whales, and create sounds. 24. It’s rare for whales to have a predator other than humans. Beluga whales, which are found in the Arctic area, are often hunted by polar bears. 25. Whale watching is one of the most popular tourist activities in coastal regions, including New England, Hawaii, and the West Coast from California to Washington.